This article revisits the curatorial concepts informing To See Without Being Seen: Contemporary Art and Drone Warfare a group exhibition we co-curated for the Mildred Lane Kemper Art Museum at Washington University in St. Louis in 2016. The exhibition was comprised of works by twelve international artists including, James Bridle, Tomas van Houtryve, Trevor Paglen, and Hito Steyerl, who work across a range of media, including photography, video, installation, web-based projects, games as well as site-specific and participatory projects. Each of these projects presented unique critical perspectives on image-making, weaving together art, activism, and research thereby treating the drone as a political object with aesthetic ramifications and trajectories. 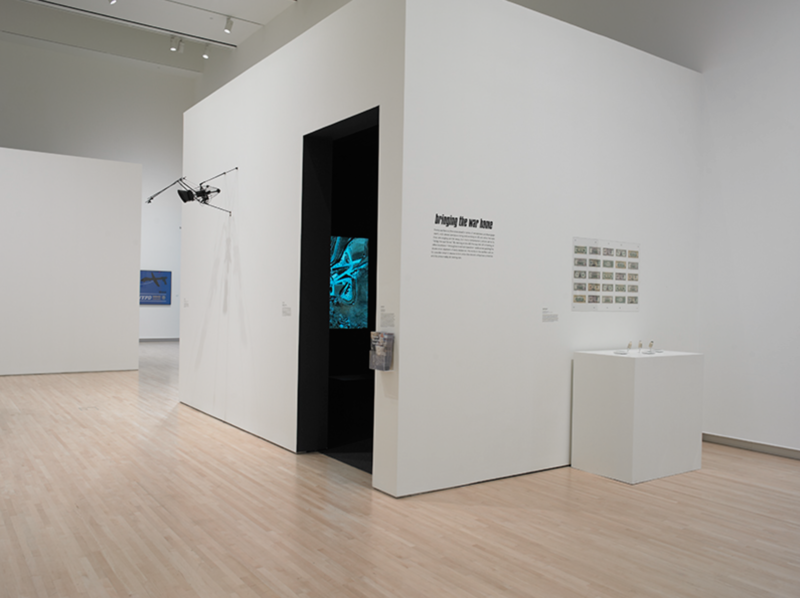 Drawing on the notion that the drone is a vision machine that is intended to remain invisible and hence possesses the power to see without being seen, our curatorial concept engaged warfare and surveillance on the level of their visual conditions, asking how certain images come into being while others stay hidden from public sight. Essential elements of that engagement based on the artworks we showed involved an examination of the drone’s global networks and geographies, the invisible culture of operative images, and measures to counter the drone’s god-like view by going unseen. The exhibition offered room for debate regarding political and perceptual changes that are actively affecting the ways in which we see the world and engage with each other. Meredith Malone is associate curator at the Mildred Lane Kemper Art Museum at Washington University in St. Louis. A specialist in post-World War II art practices in Europe and the United States, she has curated and cocurated many exhibitions, including Kader Attia: Reason's Oxymorons (2017); Encountering the City: The Urban Experience in Contemporary Art (2014); Tomas Saraceno: Cloud-Specific (2011); Chance Aesthetics (2009). Malone is currently working on the first English-language study of Edition MAT and Daniel Spoerri's pioneering role in the history of kinetic art and the production of multiples. Svea Braeunert is a DAAD Visiting Associate Professor in German studies at the University of Cincinnati. She has had research appointments at the Central Institute for Art History in Munich, the University of Potsdam, Cornell University, and Washington University in St. Louis. Her reserach interests inclue twentieth- and twenty-first-century art, literature, and film, memory and trauma studies, media theory, and gender studies. Her current book project deals with contemporary art and drone warfare.